G.S. 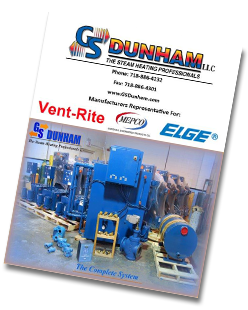 DUNHAM understands that engineers are responsible for a broad spectrum of Building Systems planning and specifications, not building heating systems alone. If your project includes a Steam Heating System, let us assist you with our expertise in this area. If your project is new construction we will assist you in planning and specifying new systems and equipment. If your project is re-hab we will be happy to meet with you at any location including job-sites to perform a survey of the current situation and what can be done to improve system performance and consequently owner satisfaction. We will provide a detailed step-by step approach and submit a report directly to the engineer for review. We can also provide pricing to help you project a budget for your client. At your request, we will arrange a power-point presentation in our classroom where you can see actual equipment and how it works. Please contact us for engineering and applications manuals.